It normally takes a few months before an English version of the report to appear, so I’ve done the same as last year and written a general summary of interesting findings from the 2012 report. 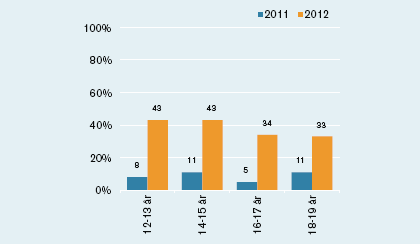 Daily internet use by age group 2009-2012. 86% of the Swedish population over the age of 18 use the internet, which is basically no change from last year. Daily usage on the other hand has edged up to 71%. Of the various age demographics between 12 and 35, 90% or more use the internet daily. Basically everyone (97% or more) between the age of 9 and 44 has used the internet at some point. Younger and younger children are using the internet and they are using it more often. In 2012 half of all three year-olds and 40% of 2 year-olds have used the internet. 16% of 3-5 year-olds are using the internet daily, and 32% of 6-8 year-olds. 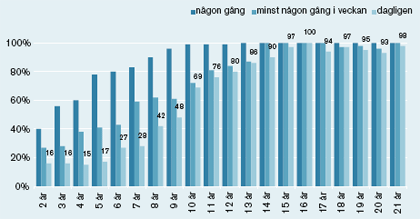 Internet usage by children & youths. from the age of 2 to 21. Legend: sometimes, weekly, daily. There has been a noticeable rise in internet use amongst school-aged children aged 8-13. Amongst pre-school kids (and older teenagers), it was relatively similar to 2011. Blogging is still a hugely popular activity amongst young women, with half of all 12-25 year-olds having written a blog post and roughly the same amount reading other blogs on a daily basis. Young boys aren’t anywhere near as interested in blogging. They are though more likely to read and post to (open) forums and communities. Quite simply, it’s not reducing. It’s been pretty much stuck at the same level since 2009. This is despite an increase in use during the same period of streaming services such as Spotify. Another interesting statistic is that those who make use of file sharing are more likely to pay for streaming services than non-file sharers. That was also the case in 2011. There isn’t though a correlation between file-sharing use and buying music. Some 1.2 million Swedes (11%) don’t use the internet. This figure has dropped with each report. 1.7m in 2009, 1.5m in 2010, 1.33 in 2011, and now 1.2m in 2012. This group consists primarily of pensioners. They are generally not interested (68%) or think it’s complicated (19%). Reasons for not using the internet. 5% of “disconnected Swedes” gave poor vision as their reason for not using the internet. This is 60,000 people who would like to use the internet, but don’t because we haven’t made it accessible enough. 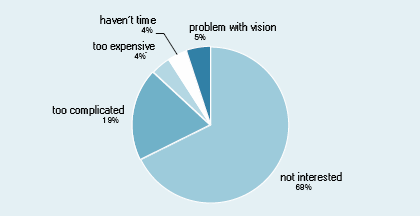 Over 400,000 Swedes use the internet less than they would like because of accessibility problems, with half of those saying vision problems are the reason. We should be ashamed of how difficult we make the internet for so many. Facebook growth has halted. The rapid adoption of social networking during recent years has levelled off. 64% of Swedes are members of a social network, up just 2% since last year. Perhaps not hugely surprising given the almost complete take-up of social media within certain age groups. Amongst the 64% who are members of a social network, there is a “silent third” that never publish a status update. It’s not clear from the research if “publishing a status update” includes interacting with other updates and published items on social networks. Publishing where you are on social media, or “geotagging” is increasing. 30% of those using the internet via a mobile device have published their position. up 5% on last year. In the space of roughly 2 years half of the Swedish population have mobile internet access. The usage of smartphones has jumped from 16% in 2010 to 30% in 2011 and then to 55% this year. Tablets are the device of choice for kids and have rocketed in use during the past year. Of the population at large (age 12+) 20% have access to a tablet. In 2010 it was just 2% and 5% in 2011. 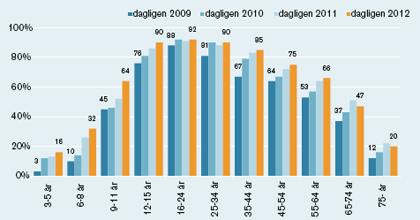 Tablet use by Swedish teenagers 2011 and 2012. Mobile internet use continues to rise. 22% used the internet via their mobile device in 2010. This rose to 36% in 2011 and is now at 54%. This usage is increasing across all age groups. Mobile internet use over time (left) and by age group (right). What is very clear from the report is that Swedes are becoming increasingly multi-device (and cross-channel) in their internet usage. They are also adopting this behaviour at an ever younger age.